Heatherton’s winner of the annual schools’ Amersham in Bloom Design a Flowerbed Competition enjoyed an extra special dimension to her certificate presentation and planting experience last weekend. The team from BBC2’s Britain in Bloom TV series were also onsite as Amersham is to be featured on the second series, due to be aired next year. 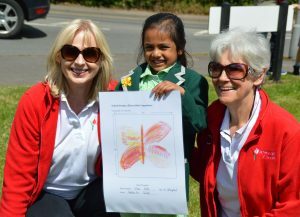 Reception pupil Sitara Sheth was one of four children whose nature-themed flowerbed design was chosen by the Amersham in Bloom team to be planted in prominent beds around Amersham. 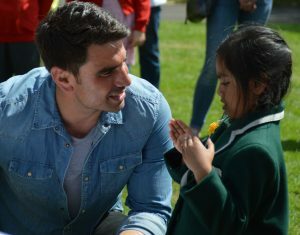 Along with the other winners, she was presented with a certificate and gift voucher by former Amersham Mayor Clive Morgan before chatting with Britain in Bloom presenter Chris Bavin about her design.